Or washing off baby food. It was clear the operational orders were to keep our eyes on the prince–in this particular fairy tale a long-haired charmer who ruined me for crew cuts forevermore (“veo que tiene el pelo largo, él sin duda me entenderá” / I see his hair is long, he will get me for sure!). And just as clear that after he swept you off your feet you would be sweeping the dirt off his. I knew instantly what I wanted to be when I grew up: A WIDOW. In the end it was more advisable for me to live in sin with Him Who Must Not Be Named than to count on his early death. 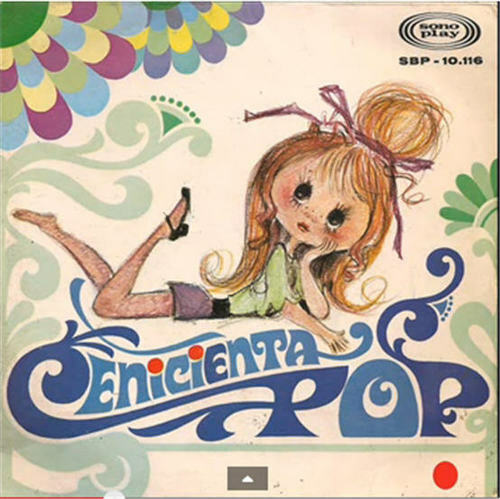 But my widow fixation continued, this time related to my academic research on the creation of women’s cultural repertoires in nineteenth-century Spain, with its Catholic variants of the angel in the house–only partially coinciding with Anglo-American models. Among these, most fascinating was the widow: at once the (figurative) virgin and the whore (most likely figurative as well). The legal frameworks of a society structured around virtually compulsory marriage left little space for non-dependent women to operate in-dependently. Fathers and husbands controlled women’s sexuality as much as their movements in both public and domestic spaces, and the confessor’s influence covered the tiny crevices outside their reach. Beyond the obvious fact that a woman could not vote, paternal or marital license was needed to exercise one of the few available occupations, enter into any sort of contract, or even manage those assets that Spanish law did consider wives’ exclusive property. As budding politician Rafael María de Labra keenly observed in 1869, there was little difference between the citizenship status of women and of colonial populations. Perhaps more surprising, though, was women’s subordination as mothers. The father, sole holder of custody (patria potestas), could even bequeath it to a male executor. Should the widow of a man deceased without a will gain hold of such tutelage, she would nevertheless lose it upon remarriage. For a woman’s remarriage was, if not unthinkable, at least eminently distasteful. As Severo Catalina, author of the immensely popular treatise La mujer (1858), put it, “es de ordinario loca la viuda que pasa á segundo matrimonio, porque si fué feliz en el primero, debe su corazon y su existencia á la fidelidad” [a widow who takes a second marriage is evidently insane, because if she was happy in her first, she owes her heart and life to faithfulness]. And yet no woman was more socially disturbing because, while a maiden’s chastity was guaranteed by her innocence and a married woman’s safeguarded by her husband, the widow’s already-awakened (and now unsatisfied) sexuality was guarded by nothing but social convention and her own conviction. Nothing attests to its perceived precariousness better than the insistence with which Catalina defends it: “La castidad de una viuda es. . . la castidad más difícil y meritoria” [A widow’s chasteness is. . . the most difficult and meritorious]. Outside the regulatory bonds of marriage, widows simultaneously seduced and frightened men, threatening their command over the public sphere. Accordingly, their behavior was among the most heavily regulated. As detailed in an 1858 legal dictionary, “la mujer que, en estado de viudez, vive escandalosamente pierde los gananciales a beneficio de los herederos de su marido” [the woman who, as a widow, lives scandalously forfeits matrimonial assets to her husband’s (other) beneficiaries]. 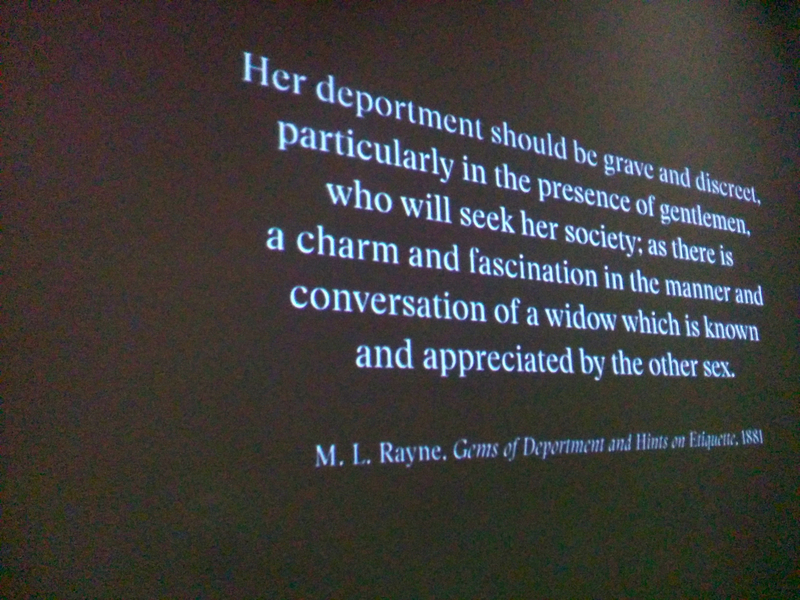 Thus the widow, perhaps more than other women, was forced to perform a social persona far removed from her “inner” self, principally through luto or mourning: practices designed to openly signify grief, conformity, solemnity, and respectability. While this code of conduct comprised myriad rituals and prohibitions, it especially emphasized dress. 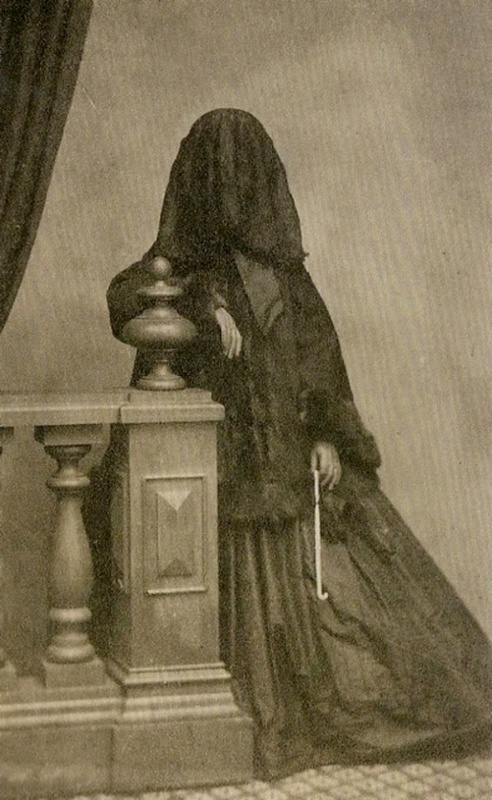 At the dawn of the twentieth century, an urban bourgeois Spanish widow was still expected to wear black for two years, gradually shifting from full luto riguroso to lighter medio luto (rural widows might wear it for the rest of their lives). 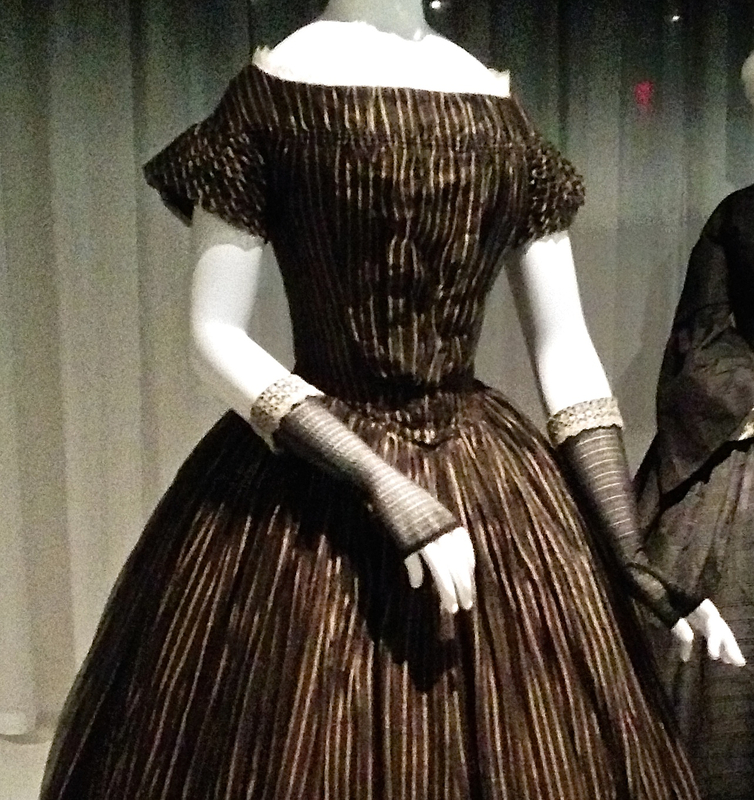 The heavy fabrics and sober styles were intended to metaphorically bury the widow alive. But when the going got tough, the tough went SHOPPING! 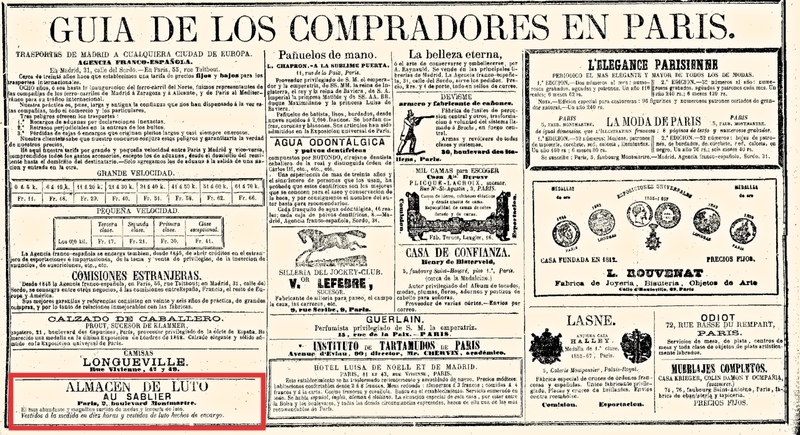 In 1855, a sarcastic (male) columnist in the women’s magazine Correo de la moda made note of a piece of popular lore: “La mujer compensa el dolor que la produce la pérdida de un pariente con el placer que encuentra en la conversación de la modista que ha de hacerla el traje de luto” [Woman makes up for her affliction at the loss of a relative through pleasant chitchat with the dressmaker who will sew her mourning outfit]. And from the folds of black taffeta emerged the defiant merry widow, unscathed. I have seen many period paintings and movies full of enlutadas. 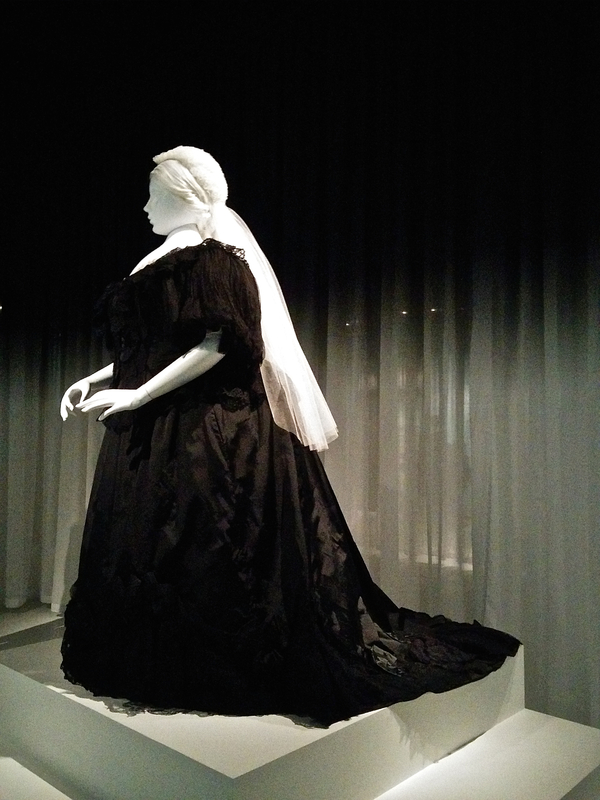 But until yesterday I never had the haunting three-dimensional experience offered by the excellent Metropolitan Museum exhibit Death Becomes Her: A Century of Mourning Attire (on view through the end of January 2015, please go!). 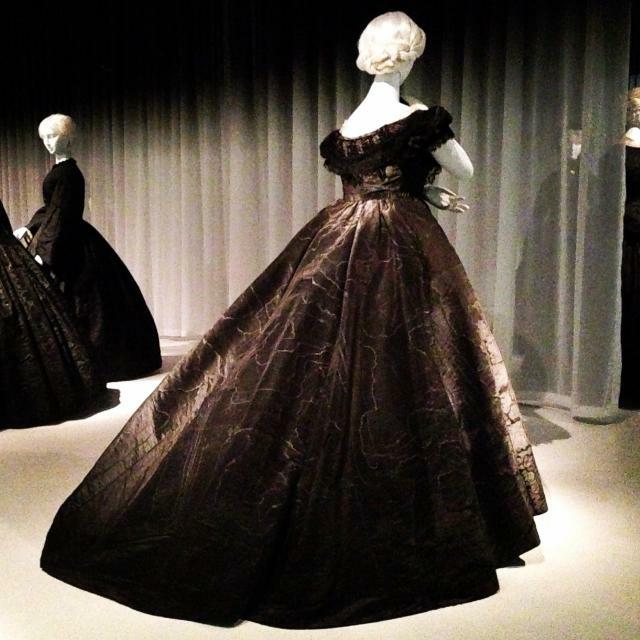 That otherworldly stroll among weeping widows, themselves long-dead (the mannequins, with their white faces and wigs, projecting flickering shadows onto gallery walls, all to Gabriel Fauré’s Requiem playing in the background), paradoxically brought to life the many layers of meaning hidden in pleats of skirt. 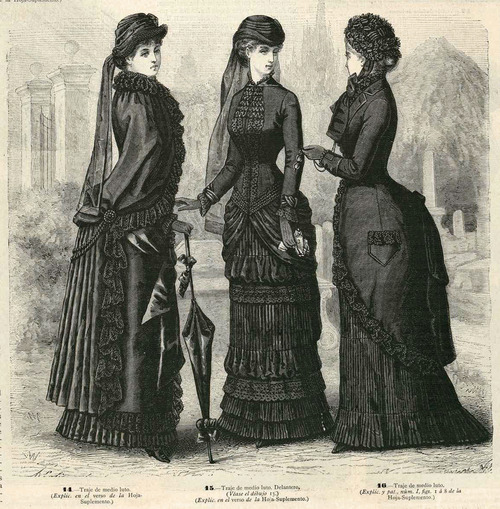 Above all, it showed widows’ radical resignification of oppressive fashions to reveal their charms in the very act of hiding them, until grief turned into alluring distress, conformity into composure, solemnity into elegance, respectability into class, indeed mourning into seduction. Death, in fact, became them: it looked well on them and suited them–enabled them to take charge of their lives by mastering a discourse of duplicity. In Spain, the rituals of mourning were first codified by the Catholic Monarchs Ferdinand and Isabella in 1497. Their proclamation on los lutos, i cera que se pueden traer, i gastar por los difuntos [the mourning and wax that can be carried for and spent on the deceased] and a corollary set of regulations both established its visible conventions–including the use of black to replace the previously customary white–and restricted its ostentation by strictly limiting who could exercise it, for how long, and in what (decorous and restrained) manner. As explained by Enrique Casas Gaspar in Costumbres españolas de nacimiento, noviazgo, casamiento y muerte (1947), widows were required to be shut away for a year in a room wallpapered in black, with no sunlight; a rule so restrictive that just two centuries later (1729) Philip V reduced it to six months. 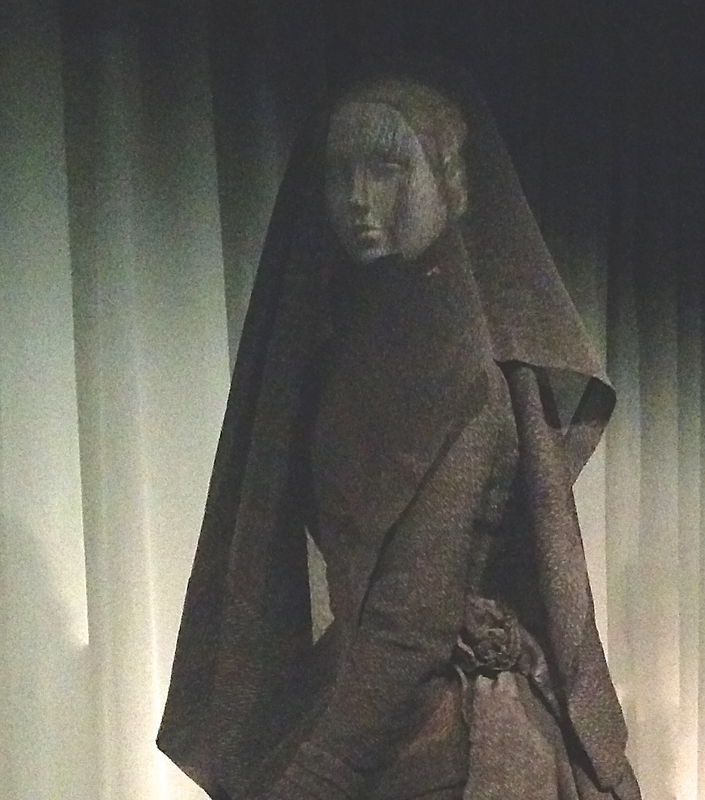 A widow’s outside dress prescribed total coverage–a sort of ambulatory substitute for the black room. By the nineteenth century, however, the ascending bourgeoisie–the first class whose social standing rested on exhibition of wealth rather than documented lineage–had begun to repel statutes enacted precisely to prevent its accession. In fact, Article 1379 of the 1889 Civil Code stipulated that, regardless of how the rest of the dowry and inheritance were handled, “en todo caso se pagarán a la viuda, del caudal de la herencia, los vestidos de luto” [in all instances the widow will be paid for her mourning dresses from the estate’s funds]. And rightly so. Because she needed a morning dress and an afternoon dress, a promenade dress, and let us not forget the evening dress. 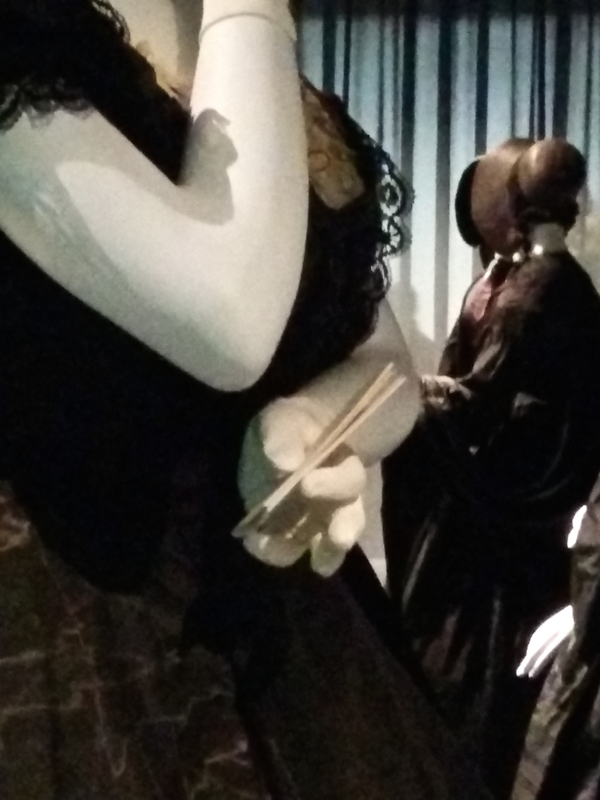 Not only did widows (and other mourning women) figure out how to transform quasi-monastic vestments into high fashion; they managed to steal the show from death through carefully placed flourishes, details that accentuated their voluptuous shapes (including the liver-splitting corset, but oh well), the delicate translucence of a glove or veil. Is that a dance card or a love note tucked into her hand? 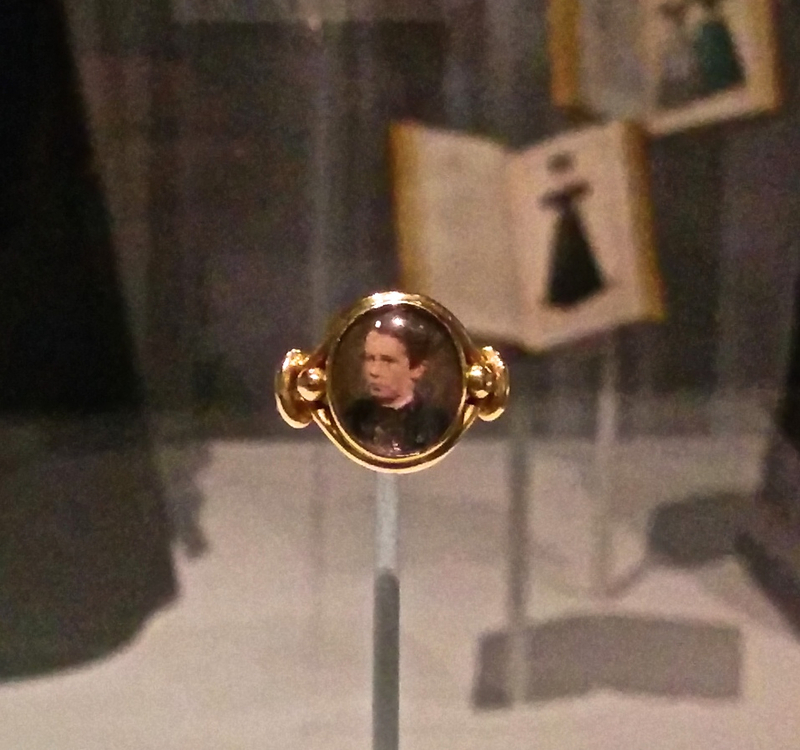 And what a way to have her husband wrapped around her finger (on a mourning ring, of course)! ¡Ay, don Luis!. . . Yo ni siquiera concibo a usted sin usted. Para mí es usted su boca, sus ojos, sus negros cabellos, que deseo acariciar con mis manos. . . Yo amo en usted, no ya sólo el alma sino el cuerpo, y la sombra del cuerpo, y el reflejo del cuerpo en los espejos. . . Soy idólatra materialista. Who would have said and done that, but a widow???!!! Needless to say, she got her long-haired priest and turned him into a prince (totally through her magic kiss!). She dressed him pretty and took him SHOPPING all through Europe. She did marry him (oh well, it was the 1870s), but still… Clearly the lifestyle for me. I figure since the Good Lord has denied me a dead husband, for the upcoming holidays I can always get a little black dress. 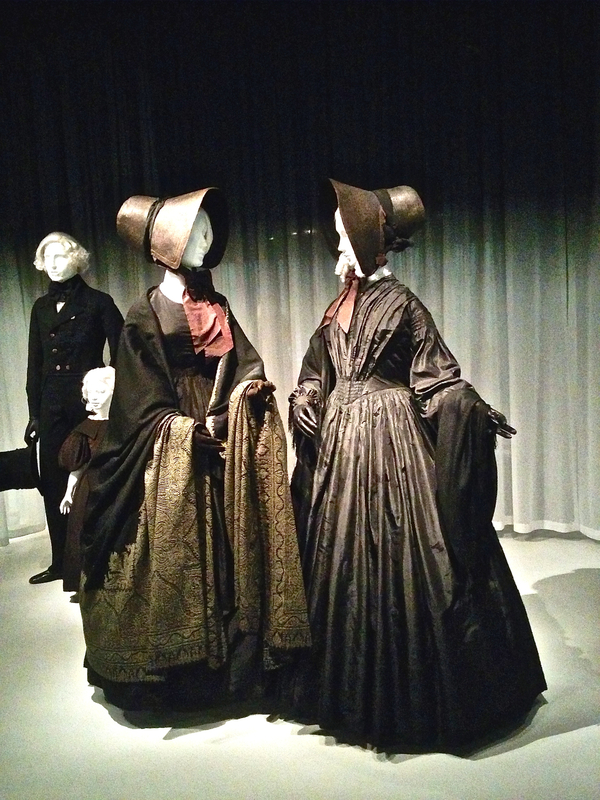 Not a Victorian one; the poor Queen’s mourning frocks were not very… forgiving. A GROOVY dress. What do you think of these?